Enhanced Hospiscare services, including new nurse led clinic, have come to Ottery St Mary and surrounding areas, thanks to £50,000 of funding from the Ottery St Mary & District League of Friends. 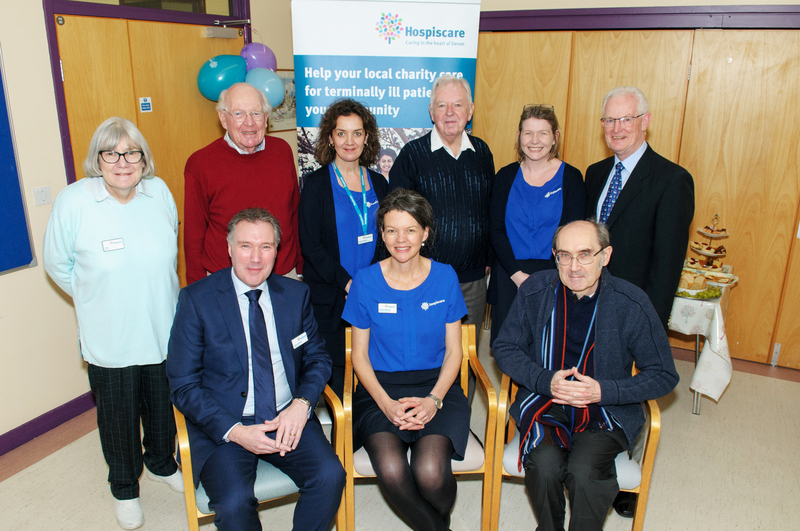 The launch was celebrated in the Sandhill Rooms at Ottery St Mary Hospital on 8th January with members of the local healthcare community. Adrian Rutter, Chair of Ottery St Mary & District League of Friends says: “When we asked the GPs of Coleridge Medical Centre what they saw as the healthcare priorities for the people of our town and villages, their answer was quick and clear; dementia care and support, children and young people’s mental health, and end of life care. The Hospiscare nurse led clinics held at Ottery St Mary Hospital allow simpler access to support for more Hospiscare patients and carers in the local area. The funding also allows for an extra 30 hours of community nursing in people’s homes and hopes to enable Hospiscare nurses to work closer with Ottery St Mary Hospital’s Rowan Ward, supporting palliative and end of life care with dementia patients and their families. Local Health Care Assistants also benefit from the funding with the formation of a support group to develop skills and knowledge in end of life care. The participants meet at Ottery St Mary Hospital and come from many healthcare settings in the local area, including care homes. The whole community benefits, particularly with the rise in numbers of Devon’s ageing population, as more Health Care Assistants become equipped to support local people diagnosed with a terminal illness. As local charities, Hospiscare and the Ottery St Mary & District League of Friends are reliant on donations from the public to carry out their work, especially gifts in wills, please consider supporting them. For more information visit www.hospiscare.co.uk or Ottery St Mary & District League of Friends www.osmfriends.org.